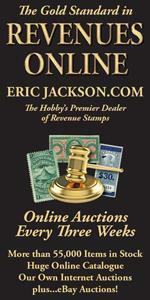 After years of working with collectors seeking to build decent collections on a budget, I am now encountering more and more—the philatelist who realizes that, if he buys wisely, he can have some great fun AND accumulate some investment property. And he doesn’t need to break the bank to do it! First of all, let’s make one key assumption: one has to spend a bit of money to make money. In general, if you are spending a few dollars a month on stamps, you’re probably having great fun, but not building much of a philatelic nest egg. But if you are able to increase your stamp budget by even a modest amount, some longterm benefi ts could materialize over the years. Take, for instance, the cover shown at the upper left—a beautiful piece of postal history (courtesy Gary Posner, Inc.) with a strip of nine of Scott U.S. No. 9, the 1852 Type IV one-cent stamp. One rarely sees this kind of large multiple of a stamp on a cover from this era. The retail price is only $1,000, by the way. Not only that, but the cost, though above what one might normally spend, is not out of the realm of possibility. The preceding is a “trick” used by many savvy collectors (whether they collect antique firearms or comic books). They seek out something seemingly ordinary, but in states that are unusual—thus creating a highly unusual, yet highly desirable, collection that has a major chance to appreciate in value. Oila!